August, 1902. Sun. 31. Fair & cool. N.W. breeze 72º P.M. - At church Morn. & evg; 5 walked to cemetery P.M. Mon. 1. September. Quite cool night; bright morn., 54º 70 P.M. - Clara took morn. train to teach school, her first, at Maude, [illegible] No 1. Jefferson TP. Office till 11 P.M. comparing with church treas. Tues. 2. Quite cool, bright morn. S.W. breeze. Fine day. Quite bus office. Had a meeting of Fin. Com. this evg. Wed. 3. Fair but very cold all day, N.W. breeze. 2nd day of Fair. - Very busy, & a which evg. with a head-ache. Mission supper at church. Thurs. 4. Clear, cold morn., & very find cold day. - Very busy; evg too Charlotte in 2 1/2 hrs. P.M. while I at Fair. - Dinner at Model. Suppers at Church. Fri. 5. Fair morn. & stiff S.E. wind. Steady rain from 11:40 A.M. to 9 evg. Dinner & supper at church. 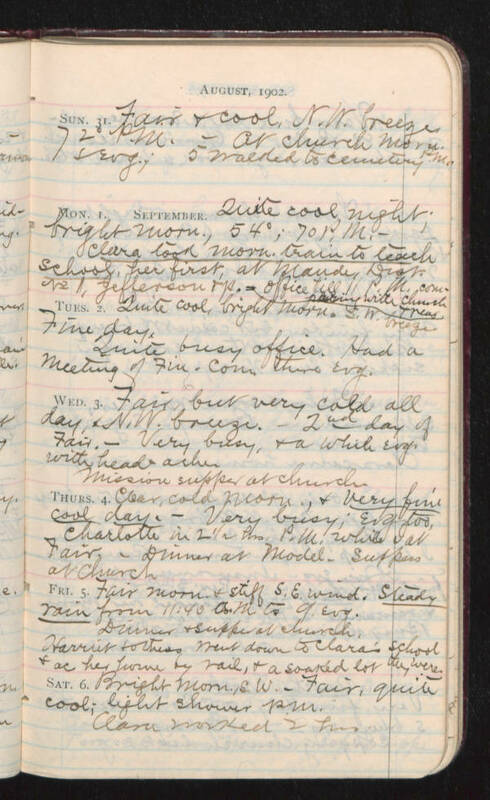 Harriet & others went down to Clara's school & ac her home by rail, & a soaked lot they were. Sat. 6. Bright morn, S.W. - Fair, quite cool; light shower P.M. Clara worked 2 hrs.